This hair is made of 100% tongable 101 fibre. It is sewn on a weft in a silky straight style. 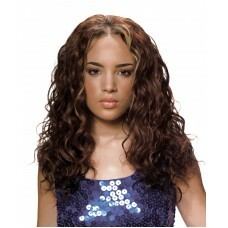 It has the human hair silky and soft touch with a very light Yaki texture to give you volume. This hair can be heat styled up to 200C. With human hair touch, this straight weft extension will be sewn on your corn row or DIY clip-in with a sleek look or can be wear as a glamour curl style when heat styled.